Chili Piper's new Meeting Series functionality allows users to book a series of meetings through a singular URL. For your first queue, we will configure a meeting that occurs weekly for 3 weeks. 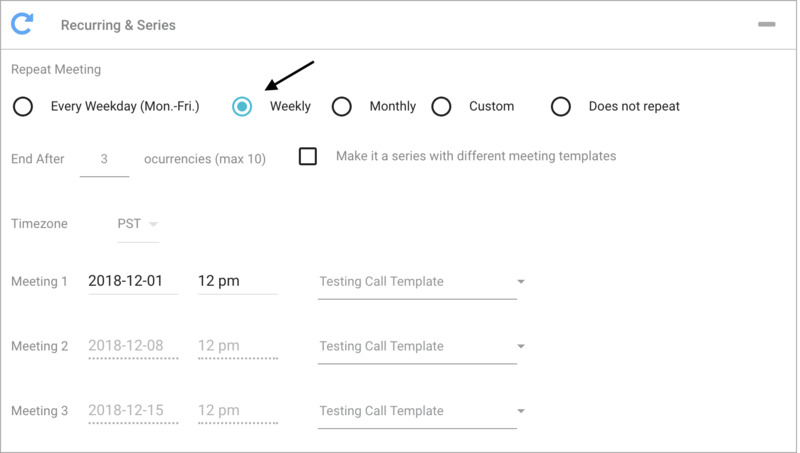 Select "Weekly" and adjust the occurrences to how many meetings you would like to occur in the series (In this example, it will be 3). Select the date, time, and meeting template you would like to use for the meetings. Select whether you would like to create a Calendar Event for each individual guests or for all guests. You can also configure if guests can see each other in the invite, limit the amount of guests, and customize a message for if the meeting is full. Add who you would like to be the Calendar Event Owner and Internal Team Members as hosts. Press "Create" and create your Meeting Series. Under "Meeting Series URL," you can find your Public One-Click Booking Link. By selecting your mail automation tool, we will generate a smart booking parameter to help identify prospects that book through your URL. Here is an article overviewing our smart booking links.